The Los Angeles Times reported that the LAPD and DEA agents raided four medical marijuana dispensaries, as well as homes in Beverly Hills, yesterday. The dispensaries are all owned by the same man. 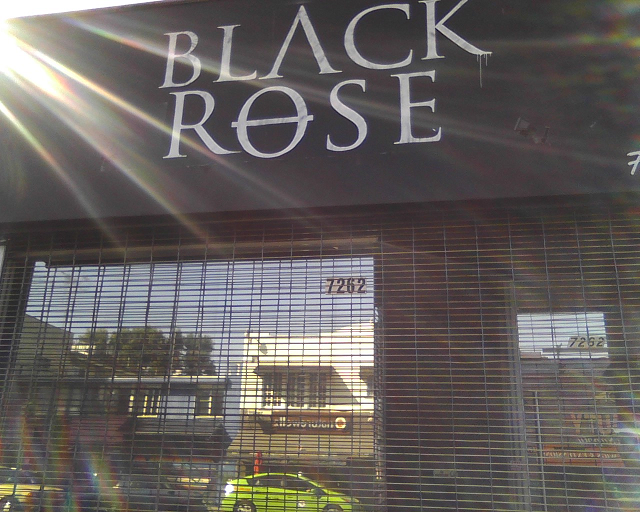 One of the locations was the Black Rose Collective at 7262 Melrose Ave. near Poinsettia Place. We also noticed that another dispensary near there has a sign indicating that they have moved. This comes just a day after City Attorney Mike Feuer announced that he will be taking action to better enforce Proposition D, which limits the number and location of medical marijuana dispensaries. That includes going after landlords who rent to dispensaries that do not qualify under Proposition D.
While medical marijuana is useful and even important for many people, the large number of dispensaries in Melrose Village is way more than is really needed in one area. Not only are they located very close to each other, but they are very close to schools and residences. It remains to be seen whether the reported raid uncovered any illegal activities as “no arrests were made and the investigation was ongoing,” according to a DEA spokesperson. Great news! There are way too many pot stores in the neighborhood, and way too many of them are very shady outfits. The people of Los Angeles voted for Prop D to limit the number of pot stores, and it’s good to see that it’s finally being implemented. I am a homeowner just off of Melrose and Poinsettia. Ii’s popular to be against these dispensaries, but consider that when these close, they will be replaced by empty storefronts for a long long time. They will become blighted eyesores. We should, and the city should be more concerned with issues like sober living houses, poor conditions of the streets, and the proliferation of boxy Mini-Mansions. And what about ‘La Brea Compassionate Care’ on the 700 N block of La Brea?!? That dispensary is located LESS that ½ block from a hebrew kindergarten! I agree with Paul—there are TOO many of these dispensaries around! Try THAT in Beverly Hills!